Life by Cynthia: The Jungle Book. Bravo Favreau and The Perfect Cast! The Jungle Book. Bravo Favreau and The Perfect Cast! Go see The Jungle Book in theaters NOW. I was so impressed with Favreau and the entire cast and crew of The Jungle book. I have seen it twice now (YES, we liked it THAT much). You must go out and see this in the theater ASAP. We will be adding this to our movie collection once the DVD hits stores. 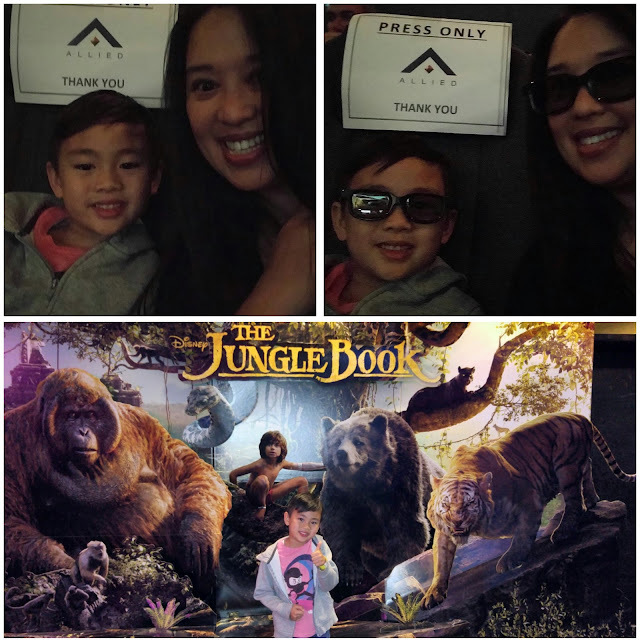 My son and I attended an early media screening of The Jungle Book on Tuesday, April 12. Our viewing was in 3D and it was visually stunning! After seeing this once in 3D and once in standard format, I must say that 3D wins all the way! Also showing in RealD 3D and IMAX 3D. Check your theater listings. The movie was exciting, touching, funny, scary, sad, and so much more. You'll feel like a kid with the wonder and magic of this production! The movie debuted on Friday, April 15. On Saturday, April 16, we (in a pack of 8 adults and 9 kids) went to see it AGAIN. It was the first for the rest in our party. It was a hit with the 17 in our group and box office results are showing that the movie is on track to top $1 billion globally. The movie is rated PG. There are scary action sequences and moments of peril. My five year old jumped when fearsome tiger ShereKhan pounces out of the tall jungle grass. The nice, 50+ year old woman sitting next to him reacted the same! So whether you are 5 years old or 50 years old, you just might be jumping out of your seat! It really is an exciting adventure. The ferocity of the action sequences is something to consider for young children. My man cub was fine. During our second viewing with a wolf pack of 7 boys, one (who is a bit older than my son) seemed a bit upset and watched with fingers in his ears and eyes nearly closed during the scary action scenes. I can totally relate. Some scenes were terrifying! At that age I likely would have reacted the same. 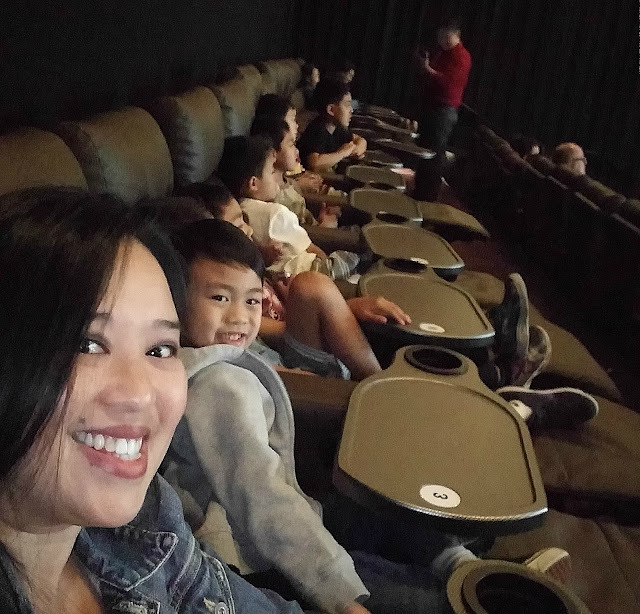 Our Wolf Pack of 7 man cubs took up an entire row at the theater. Visit the official THE JUNGLE BOOK website here: http://movies.disney.com/the-jungle-book-2016 Have you seen it yet? I would love to know your thoughts on the movie! If you are planning to see the show, make sure to stay until the end of the credits, as even that part was great entertainment! Disclosure: I attended a free media screening so that I could share my thoughts on the film. All opinions are my own. We are going to see it this week! Can't wait. We were going to se it in standard format, but now you have me thinking 3D would be better! You will love it! Thank you so much for stopping by! WOW! Now I MUST take the kids to go see this movie! I loved the story as a child! Enjoy! I'd love to hear your thoughts after you check it out with the kiddos.